Writers great and small have found creativity and solace in many weird and wonderful places over the years. 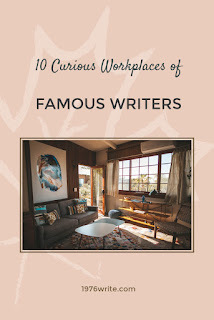 Many literary geniuses have gone beyond the humble desk and chair to create their ideal writing spots, instead opting for a bathtub or hike in the wilderness. I present you with 10 of the most curious workplaces of famous writers. 1. MI5 Officer John le Carré spent many hours writing on his long train rides from Buckinghamshire to London, composing his debut novel Call for the Dead. 2. Oliver Twist creator Charles Dickens had his desk and all its contents shipped to his vacation home. 3. The seat of a Model T Ford was the perfect writing place for Gertrude Stein. Shopping excursions around Paris with her partner Alice B. Toklas were particularly productive for this writer. 4. The shade of a tree was good enough for D.H. Lawrence, resting on pine trees in New Mexico to the Black Forest in Germany. Considering his proclivity, Lawrence noted, "The trees are like living company". 5. While renovating her mansion Agatha Christie instructed her architect "I want a big bath, and I need a ledge because I like to eat apples". Composing her plots in her Victorian tub nibbling on an apple. 6. Edith Wharton wrote her manuscripts in bed, resting in between her covers with her dog next to her, and an ink pot by one arm. A pile of papers would appear, which would be later retrieved by her maid for the secretary to type. 7. A clean white desk, a typewriter and a small window in a private place, was enough for George Bernard Shaw. 8. Wallace Stevens would walk 2.5 miles to the Hartford Accident and Indemnity Co., composing poetry between his doorstep and the office door. 9. A small publishing company was started by Virginia Woolf and her husband Leonard in 1917. Despite this new enterprise Woolf continued to write. Walking down to the basement every morning, passing the printing press and into a storage room where she would sit, pen in hand, in her cosy old armchair to write. 10. Dame Edith Sitwell would start her day's writing lying in a coffin.